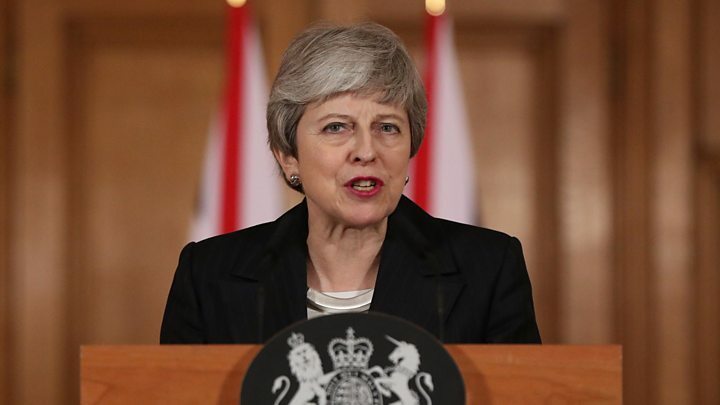 Theresa May has told MPs there might not be a third vote on her Brexit deal next week if there is insufficient support for it to pass. If it does not pass, the EU has set a deadline of 12 April for the UK to propose a new plan. Supporters of another EU referendum are due to march through central London later. Labour's Tom Watson will speak at the event, pledging to back May's deal if she agrees to hold a referendum on it. Meanwhile, an online petition calling for the UK to remain in the EU has attracted a record number of signatures. By 11:32 GMT, the total number of signatures calling for Article 50 to be revoked stood at 4,151,815 - beating the previous record reached by another Brexit-related petition in 2016. If Mrs May's deal is approved by MPs next week, the EU has agreed to extend the Brexit deadline until 22 May. If it is not - and no alternative plan is put forward - the UK is set to leave the EU on 12 April. In a letter to all MPs on Friday evening, Mrs May offered to talk to MPs over the coming days "as Parliament prepares to take momentous decisions". Revoking Article 50 - cancelling Brexit - which Mrs May said would "betray the result of the referendum"
Children's minister Nadhim Zahawi told the Today programme failing to support Mrs May's deal would lead to a "meltdown in our politics, not just for the Conservative party but for all parties". Indicating he would stand down if Mrs May's deal is not voted for, Mr Zahawi said he "cannot justify" going to his constituents and saying: "We failed to deliver this and that now we are having to stay in the EU and go into European elections." Mrs May also confirmed in her letter that the government would change the law to officially change the UK's departure date from the EU next week. 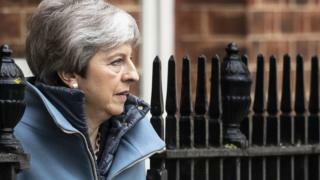 Image caption Theresa May said asking for an extension was a matter "of great personal regret"
Her letter came after the DUP - whose support will be crucial if the government is to win - indicated they still would not back her deal. She acknowledged that "a number of colleagues had raised concerns" about her words and said it had not been her intention to make their "difficult job... any more difficult". Former Tory chief whip Andrew Mitchell told BBC Radio 4's Today programme "there was a very strong feeling she'd made an error of judgement" on this. But dismissing reports of growing pressure on Mrs May to quit, he said: "To change prime minister would be a colossal error - it won't change the numbers [in the vote for Mrs May's deal]". Theresa May's admission that there may not be a third vote on her deal after all will focus minds on what an alternative plan might be. A series of indicative votes in Parliament looks the most likely way to decide that - but there is no agreement on whether the government should lead that process or relinquish control to Parliament. Meanwhile, campaigners say they expect hundreds of thousands of people to march through central London as part of the 'Put It To The People' demonstration. Speakers at a rally afterwards will include Labour's deputy leader, Tom Watson, Scotland's First Minister, Nicola Sturgeon, London Mayor Sadiq Khan and others. Mr Watson will say: "I've come to the reluctant view that the only way to resolve this and have legitimacy in the eyes of the public is for the people themselves to sign it off." James McGrory, the Director of the People's Vote campaign, told BBC Radio 4's Today programme: "Politicians are unable to agree on a way forward so it seems to the People's Vote campaign that the only way forward it to put any Brexit deal - whether it's the government's deal or any alternative form of Brexit - put it to the people." Ms Sturgeon said now was "the moment of maximum opportunity" to avoid a no-deal Brexit. A petition on Parliament's website calling for Brexit to be cancelled by revoking Article 50 has attracted more than four million signatures. Lib Dem MP Layla Moran said the petition could "give oxygen" to the campaign for another Brexit referendum. Speaking in Brussels on Friday after the European Council agreed to delay the Brexit date, Mr Tusk said that until 12 April, "anything is possible" including a much longer delay or cancelling Brexit altogether. "The fate of Brexit is in the hands of our British friends. As the EU, we are prepared for the worst, but hope for the best. As you know, hope dies last." According to the final summit conclusions, the UK is expected to "indicate a way forward" before 12 April, if MPs do not approve the withdrawal deal negotiated with the EU, which would then be considered by the European Council. The UK must decide by then whether it will take part in European Parliamentary elections from 23-26 May - if it does not, then a long delay would become "impossible", Mr Tusk said. Mrs May will need to table secondary legislation to remove the date March 29 from Brexit laws.